Conservative Christians are bashing on Starbucks’ new red cups. For Christians, Christmas is the “best time of the year,” but because Starbucks simplified their cups, “Christmas is ruined,” said Amanda Peers on Twitter. 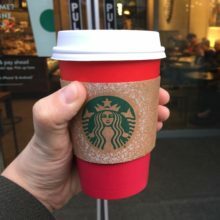 Starbucks’s new holiday cups lack design because they wanted to be “universally appreciative and applicable to all religions and beliefs,” said Aaron Deen, Starbucks employee. Starbucks also wanted customers to be creative and optimistic and make their own designs on the plain cup. The hashtag, #merrychristmasstarbucks, was trending worldwide on Twitter. Christians used this hashtag to complain about how he cups were not festive are enough. On Nov. 10, Donald Trump announced for Christians to strike against Starbucks until they change the cups back. Who knows what Starbucks will do but they have not yet answered to the bashing.